Having been a bookseller for so many years, I am very familiar with Lauren Myracle and her two very popular series, the Winnie Years and the Internet Girls, which, told entirely in texts, emails and IMs, was especially innovative and popular (and prescient) when first published in 2004. But, having a proclivity for fantasy, it took me until now to finally read one of Myracle's books. The blurb for Wishing Day grabbed my attention immediately. 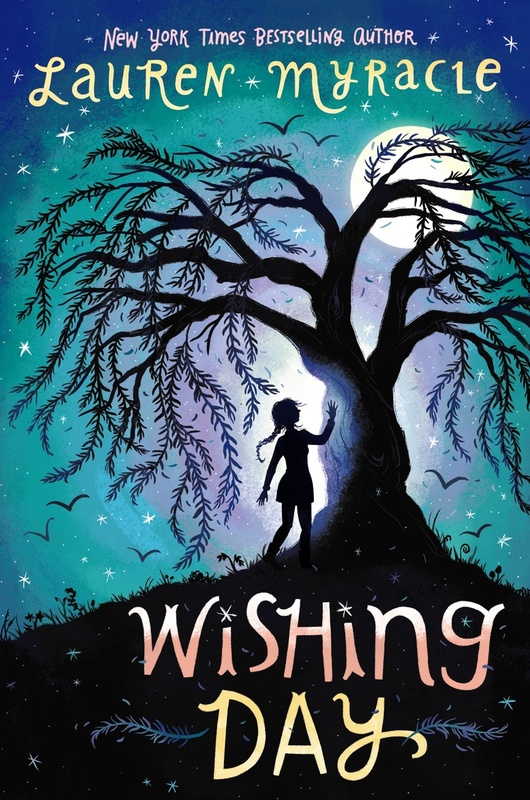 On the third night of the third month after her thirteenth birthday, every girl in the town of Willow Hill makes three wishes: the first is an impossible wish, the second is a wish she can make come true herself and the third is a wish made from her deepest, secret heart. Natasha Blok is the oldest of three sisters born in under three years. In fact, her sister Darya is in seventh grade with her. Ava, their youngest sister is in sixth grade. As Wishing Day opens, Natasha is at the ancient willow tree, planted by her grandmother many times removed, the woman who started the wish tradition. Her aunts, Vera and Elena, are steps behind her, waiting anxiously for Natasha to make her wishes. Natasha's mother Klara disappeared eight years earlier, leaving her father sinking into sadness and silence and her aunts moving in to raise their nieces. Of course Natasha wants her mother back, but she also wants to be kissed and she secretly wants to be somebody's favorite. Myracle's story rich with layered characters. Natasha is a typical big sister, stepping in and caring for her siblings after her mother vanishes. Yet, she also lets a distance grow between herself and Darya, who, with a head of red, shiny curly hair, a flair for fashion and a firm disbelief in magic of any kind, especially when it comes to the Wishing Tree, seems like Natasha's opposite. And, an even deeper secret than her three wishes is hidden under her mattress. Natasha is a writer, albeit a writer who has yet to finish a story. As Wishing Day unspools, Natasha learns more about her mother's complex life before she disappeared, finishes writing her first story and kisses a boy. She also has her deepest secret self revealed when her sisters discover her writing and enter it in a local contest, she is not kissed by the boy she thinks she wants to kiss her and Natasha might not even want to be kissed at all. Most surprisingly, discovers that she IS someone's favorite, but whose? Myracle also weaves in a thread of magic - beyond the Wishing Tree itself - in the character of the Bird Lady, an eccentric, ancient legend in Willow Hill who has a sparrow nesting in her fluff of grey hair. The Bird Lady appears every so often to utter cryptic words to Natasha as begins finding meaningful notes around town. The ending of Wishing Day will leave you wondering and wanting more (especially more answers) and, quite happily, there is more to come because this is an intended trilogy! I suspect that the next two books will focus on serious, gorgeous, skeptical Darya and the ethereal, playful, free spirit Ava as Natasha's sisters turn thirteen and make their own wishes.